Taylor Knox finished fourth in the world in 2001, the closest he's ever come to winning a world title. 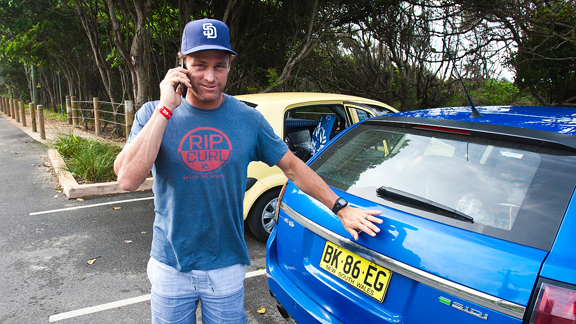 But after dispatching Owen Wright Monday at the Hurley Pro, there's still some bite to his bark. Taylor Knox is a surfer's surfer. For two decades now, he's been one of the most affable, likeable surfers on tour. His rookie season was back in 1993, the same year Gabriel Medina came kicking and screaming into this world. He may not be the aerial master, but rail for rail, he can turn with the best of them. 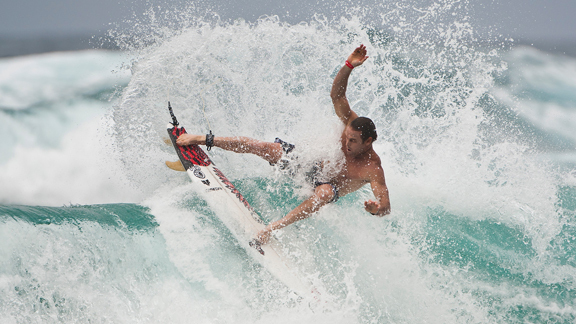 Alhough he's come close several times, Knox is a power surfer without a world title. ESPN Surfing recently sat down with the man that holds the distinction of being the oldest surfer on tour to get his take on surfing, surviving and where the sport's headed. Can you give us a quick overview of your career, like how old are you? And when did you start surfing? I turned 41 in May, and started surfing when I was nine. At Oxnard Shores. Your life-changing car accident and its impact? It happened when I was six years old and I got a hundred stitches in my face. That impacted me growing up since kids are so brutally honest. Then at 15, I had severe pain going down my leg, which was from my last vertebrae being more out of line with the rest of my spine than the doctors had ever seen. They couldn't understand how I was still walking around and scheduled an emergency surgery. They fused metal and bone from my hip into my back, and I was in a body cast for six months. It put the brakes on my NSSA career, and my dream to be a pro surfer, I had that goal since the third grade and all the way through high school, it never changed. What age did you turn pro? I turned pro at 19, at 20 I was surfing in the Bud Tour events, my first contract was with OP. I believe I qualified for the World Tour in '92, when I was 22. I've been on tour for like 18 years, longer consecutively than anyone else in the history of the ASP. Definitely winning the K2 Big Wave Challenge in '98, by far the biggest award outside the contests, and a great achievement for me. It gave me a lot of notoriety and helped my career in many ways. Landing on tour in 1993, Tnox's career predates the advent of cell phones, the Internet, and the birth of Kolohe Andino. Any thoughts on all the talk about you being the oldest guy on tour? Proud, stoked, or over it? Sometimes it gets a bit old since it's the go-to question most people come at me with, but I'm also very proud of that, for sure. Any secrets on how you've been able stay on tour so long and keep your surfing so relevant, physically and mentally? You know, being inspired by these young guys, like Dane Reynolds, Kolohe [Andino], and all the others. Then there are guys like Mick [Fanning] and Kelly [Slater], so there's always that inspiration coming from others to be a better surfer. I'm just super stoked. And, obviously, I've always been a better free surfer than competitor, but there's still some challenge for me to be a better competitor and I'm still out there to win. The challenge for me is more mental. But surfing wise, you never master surfing, so that's another challenge. Have you ever thought about retiring from the tour, even when you've requalified? Yeah, about six years ago I seriously thought about it, but when I get into that frame of mind I need to spend time by myself to make a big decision like that, so I went away by myself for a couple of weeks and decided I wasn't done yet. Obviously, I won't be on tour for another five years, but I'm so inspired by surfing and I love being around the best surfers in the world. There will be a day when the inspiration will change, just trying to get better waves with less people out (laughs). How do you feel about critics who write and talk about this being your last year on tour? The only way it's affected me is that I've stopped reading all that crap, really. Then if there was someone writing those articles who's actually been on tour for 20 years, then maybe I would pay attention to it. You know, all I do is ask myself, "What has this guy done in surfing, again?" Still one of the most powerful surfers, Knox is as solid as they come in any and all conditions. At 41 and admitting that you won't be on tour in five years, how does thinking that this could be your last year on tour affect your appreciation of your years on tour, and all the places and friends around the world that you might not see as often? About ten years ago I got into meditating, and it's really helped me and changed my life and looking within myself. When you say, "Am I going to appreciate this year more than the others," um, no, I'm not. I don't feel like I'm losing anything, and I'm not going to stop traveling. So, it's going to be different, but in a really good way. I'll be going to spots where there will be nobody out and the swell will be perfect, with a few of my best friends, just not 45 of my best friends (laughs)! I do enjoy being out in the water in a contest when the waves are good and firing, but at the same time, I'll still be friends with all these people. But there's always the challenge, and there's a little chip on my shoulder when people say I'm old, but it makes me go,"I'm just going to prove you wrong again," or my friend Kelly is going to prove you wrong, you know, forever! We're kind of an exception to the rule, Kelly and I grew up with Shane Dorian, Ross Williams, Rob Machado, etc., such an amazing group of surfers, and a big group to do so well for so long, to be on top of their game. Still to this day it's an amazing group. I mean Ross and Rob have both been off tour for ten years, but I'd put these guys up against anyone. We might not have the aerial repertoire as some of the young guys, but when it comes down to big turns, big bottom turns with power, or barrel riding, my money is on these guys. What do you look forward to when you do retire from the tour, and what will you be doing? Freesurf trips, big waves, an industry job? I really have an interest in making some movies, traveling, and going places I've never been. And I think with my kind of surfing, that my type of surfing looks good on film, in good waves. There's not a lot of surfers that can use their rail and are power surfers, I think that's still an aspect of surfing that people love to watch. I'm always trying to get better with my style, I'm really into style. I grew up and my idol was Tom Curren, and I'd rather watch Tom just going down the line. There's an aesthetic thing about surfing, and to me that's what's so beautiful about it.